In November 2009, the Indian Reserve Bank quietly announced that they are buying 200 tones gold in 6.7 billion (Rs 31.654 crore). While the world was drowning in recession; Europe and America's prosperity had also noticeably slow-downed; this purchase was saying a new story of India’s confidence. This was the topic of official gold, if we speak about the personal gold kept by the Indians unofficially then we’ll be No.1 in the world rank. According to a report by World Gold Council, Indians have over 18 thousand tons private gold; i.e. highest in the world. India was once called the, “Golden Bird”. By the 17th century, foreigners coming to India were surprised to see how the people were laden with extraordinary gold jewelry. After the British came, lord knows what sort of bad luck rolled over the country. In over hundreds of years British ruled over us, they swallowed our country’s prosperity. When the British came to India, their eyes went wide seeing our vast opulence and splendor. Can you imagine; to rob the Somnath Temple Mahmud Ghazni invaded India not once or twice but fourteen times! Gold is considered sacred in India; therefore it is plated on a large scale in temples and monasteries. There’s so much gold in the temples of South India that if it’s accumulated then the world’s gold would stand nowhere near India. When the British looted gold from India and started sending it to Britain, Indian Royal Families hid large number of their and temples’ gold. Even today there’s a myth that buried gold and precious treasures are scattered across the country, in hundreds of forts, palaces, temples and other places. The truth is that even from before BC, gold has been extremely important in India. There has been a description on Gold jewelry and coins being found in the Indus civilization. In Vedic times, its use in religious and worldly ways grew. The value of gold increased the highest in Mauryan dynasty. The use of gold in the middle Ages and the Mughal period was at its peak. European sailors always had one dream, to come through India at least once. Wascodigama visited India three times and each time took a great quantity of gold for business. Over the last decade, there had been over 50-60 million marriages in India, and we know how much is the value of gold in Indian weddings. The country's 50% population is under the age of 25 years. And according to this statistic, there will be one and a half million marriages in the next decade; that means that the gold market will get even hotter, and gold’s demand will continue to grow wildly. For Indians, gold is the part of the well-being and tradition. Indians have a magnificent love for gold. We believe it as the symbol of good luck. Gold is connected with our traditions, beliefs, customs, festivals and rituals. 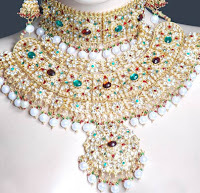 Indian woman does, “Solah Shringar”, meaning a different jewelry for every part of the body; that means becoming complete by wearing sixteen types of jewels. Gold is also the metal of love. The heart beats at the sight of gold ornaments. Its importance grows when a woman wears it in form of jewelry. In India it is a tradition to buy gold on every other festival. Gold is bought on Dussehra - Diwali and Dhanteras. In South India gold is bought a lot on, Akshay Trateya, Pongal, Onam and Ugdi. In Eastern States, gold is purchased in Durga Puja. Gold has special significance; in Western States on Gudi Parva, and on Baisakhi and Karwa Chauth in Northern states. As all these festivals are connected with crops; wavy crop in itself is a sign of prosperity and wealth to come. India is an agricultural nation. Therefore there is a remarkable coordination between better yields, festival and buying gold. Through ages, people have been hypnotized by gold. Its brightness is enticing, it calls one towards it; giving a feeling of being relaxed and powerful. It is pure, sacred, classic and is immortal. It is praised in the Vedas and is also dear to the gods. There had been so many battles over it in history; many empires were built and destroyed because of it. The importance of gold has never wavered. It has been going on since Manukal and will keep on moving forward. and it will always be the same... :) hai na?